Penang, Malaysia -- THE dharma which Thai monk Dok Kem Pa has been practising for the past 30 years had opened up his ‘inner eyes' to nature. Dok Kem, who is from Haadyai, claimed that this has given him the power to go beyond his own thoughts and feel the nature around him. 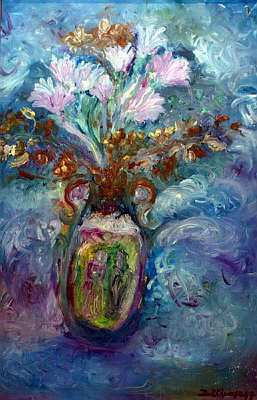 << 'Still-Life' is an oil painting of a vase of flowers by Dok Kem. Through this, he said he was inspired to paint them. “It's the power of the nature that draws itself through my hands,” he said in an interview after the opening ceremony of his first solo exhibition in Malaysia – ‘Return to Nature’ at Alpha Utara Gallery in Penang recently. Believing that beauty is blooming everywhere around him, Dok Kem said the calmness through meditating helped him to reach the ‘ultimate truth in nature’. ”I started painting 10 years ago and I wanted to share with others what I see and feel about everything around me,” he said. He added that he drew everywhere and anywhere with all techniques, including using his own fingers as paintbrushes. “Ideas come to me spontaneously and continuously, and once I feel them, I can paint,” Dok Kem said, explaining that a big canvas painting would take him no longer than a few hours. The 43 paintings exhibited, from flowers to Buddha, forest to the universe showed the clear and sharp mind of the painter, whose name itself ‘Dok Kem’ (a kind of flower) represents wisdom in Thai culture. Car dealer Ng Eng Seng, 44, who bought two black and white ink paintings on the first day of the exhibition, said he could actually feel the ‘tranquillity’ in the paintings. “He has many colourful oil paintings with attractive motives but there is something special in the black and white ones,” Ng said. The exhibition is open to the public until Dec 20 from 10am to 6pm Mondays to Saturdays, and 12pm to 5pm on Sundays. Admission is free. The paintings are priced from RM600 to RM6,000. Fifty percent of the proceeds will go to the World Fellowship of Buddhist, Penang Regional Centre and Wat Nai, Penang.